We are committed to providing educational resources for the public, professionals, and the media that illustrate the expertise psychologists possess that can help improve lives, families, workplaces, communities, and practices. How Do Psychologists Differ From Other Mental Health Professionals? In addition to mental health care, what other services can psychologists provide? Are you a psychologist who needs guidance and a deeper understanding of the principles and standards of a particular practice area? Are you a permit holder in need of a supervised hours? Supervision is done in the context of focusing on the treatment that is unfolding in a particular patient. It is unique because the focus is on the actual clinical data from a patient at a particular point in time. Consultation involves offering generalized expertise with regard to particular subject matter. The NJPA members listed here are licensed psychologists and members in good standing with our association offering supervision and consultation services. This list is open to NJPA members and non-members. Contact the psychologist directly to discuss your needs. In New Jersey, the title "psychologist" is reserved for those who have met the rigorous requirements set forth and governed by The State of New Jersey Board of Psychological Examiners. Those requirements include completing a doctoral study (PhD, PsyD, or EdD) in psychology, completing a supervised clinical internship in a hospital or other organized health setting, and passing a national written exam and state required exam before becoming licensed. Psychologists, who are highly trained professionals, have expertise in assessment, diagnosis, and treatment and work with clients to change feelings, thoughts, and behaviors through techniques that are based on research. The psychologist assists clients in problem solving, developing new skills to face challenges, and helps clients take advantage of available resources. How do psychologists differ from a psychiatrist, a licensed social worker, a marriage and family therapist, or a licensed mental health counselor? Psychiatrists are medical doctors who have done a three-year residency in psychiatry. They can prescribe and manage psychiatric medications. Licensed clinical social workers have a master's degree plus 3,000 hours of internship training. They are trained in psychotherapy and work with individuals, as well as families. Marriage and family therapists have a master's degree and internship training. Their training primarily relates to marriage and family, but some might have extra training working with children or adolescents. Licensed Professional Counselors (LPCs) earn either a master's or doctorate degree and must complete 3 years of supervised experience. Psychologists receive a median of 7 years of education and training beyond their undergraduate degree, including practica and internship training in hospitals and other health care settings. Professional licensure is generally uniform throughout the country, authorizing a psychologist to independently diagnose and treat mental and nervous disorders upon completion of a doctoral degree in psychology and a minimum of two years supervised, direct clinical service. 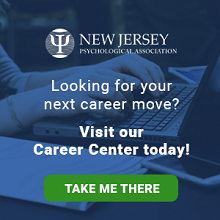 In NJ, the candidate must pass the written Examination for Professional Practice in Psychology administered by the Association of State and Provincial Psychology Boards and the state licensing test. 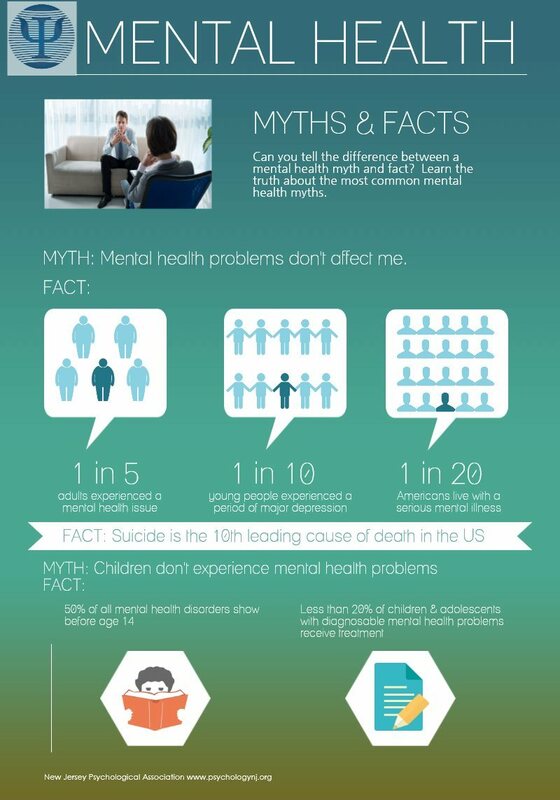 An estimated 22.1% of Americans aged 18 and older, about 1 in 5 adults, suffer from a diagnosable mental disorder in any given year. Psychotherapy is effective alone or in combination with medication to address a wide range of mental health issues, including anxiety, depression, substance abuse, and other disorders that can devastate an individual's personal, family, social, and work life. Therapy is a collaborative process between client and psychologist. The psychologist employs different orientations of therapy that are rooted in research, to assist the client to understanding feelings, change his/her behavior, and navigate through changes in his/her life. People may consider therapy when they are feeling overwhelmed, sad, anxious, helpless, and hopeless. People may also consider therapy when functioning day to day becomes difficult or when their actions become harmful to themselves or others. Individuals may seek therapy in group settings, when family members or close friends are facing difficulty, or individually. Therapy can be covered by insurance, however every policy differs. It is best to contact your insurance company to find out about co-payments, deductibles, lifetime maximums, as well as annual maximums. Ask how many treatment sessions will be covered and find out if there is a group of providers or a "network" that you must choose from. Also ask if your insurance will only cover people with certain degrees. Finally, you may contact our online referral service to assist you in finding a psychologist with a particular specialty. Are psychologists trained to work with diverse populations? Psychologists are trained to provide services to an increasingly diversified national population. Racial and ethnic minorities experience access-to-care and socio-cultural difficulties that must be addressed to ensure quality care. Women, children, and adolescents, the elderly, persons of diverse sexual orientation, and the disabled have unique needs that call for the interventions psychologists are trained to provide. Physicians and other health care professionals turn to psychologists for their state-of-the-art diagnostic capabilities, including, for example, the detection and assessment of functional impairment, and for rehabilitative services and treatment. Preventive Care - The screening and assessment services provided by psychologists are key to detecting and identifying patients' mental health issues. Psychologists are trained to help patients develop coping strategies and healthy behaviors that promote and maintain both mental and physical health. Primary Care - Mental health services are critical primary care services, especially in rural and medically underserved areas. As many as 70% of primary care visits are driven by psychological problems, such as anxiety, depression, and stress, and 24% of patients who present themselves to primary care physicians suffer from a well-defined mental disorder. Primary care physicians increasingly rely on the vital and unique mental and behavioral health services that psychologists provide. Increased access to psychologists in primary care improves the coordination of care and treatment planning, while reducing the stigma associated with seeking mental and behavioral health treatment. Chronic Disease Management - Psychologists work in primary, acute, and long-term care settings to treat patients with chronic conditions, such as diabetes and conditions stemming from obesity, and patients with life-threatening illnesses, such as coronary artery disease and cancer. Psychologists help patients manage pain, cope with medical interventions and their effects, and address family needs and the intangible aspects of illness. Psychologists provide services in healthcare facilities and many other settings such as outpatient care, inpatient, integrated health care, schools and the workplace, and the criminal justice system. Psychologists also help the victims of disasters or terrorist attacks understand and cope with their experiences.